Sunday, Nina and I walked down to the Chicago Antique Market, it takes place about 8 blocks from where we live on the last weekend of each month from April through September. This is the first weekend I have either been in town for it or did not forget to go and unfortunately it was the last day for this year. 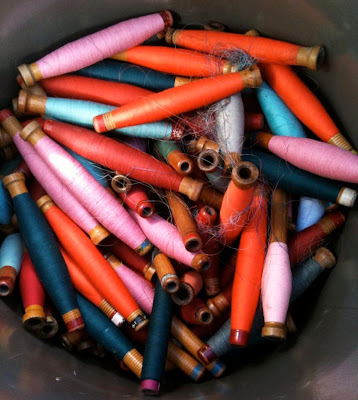 One of the first things that caught my eye was this barrel of large spools of thread from the defunct textile industry of South Carolina, these are about 10 inches long. 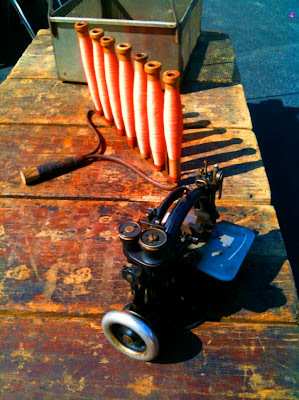 I thought the display of thread spools on this old rake head was wonderful. 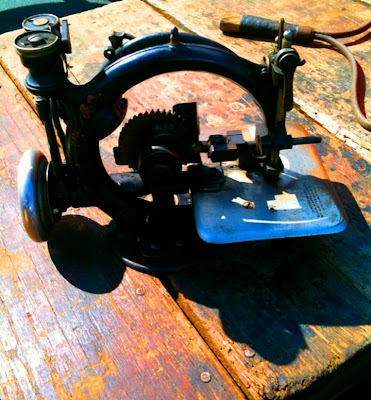 Check out this little old sewing machine. 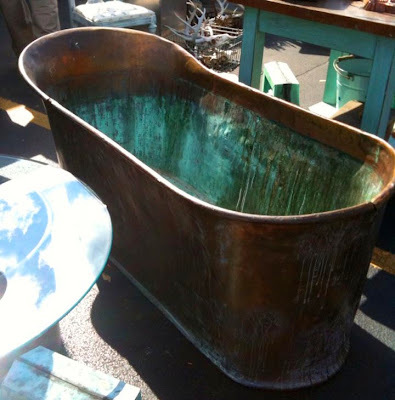 I love this old copper tub. 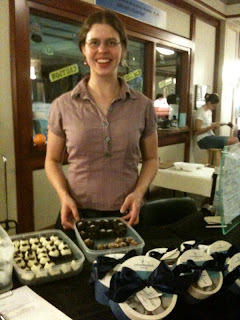 This is Katherine Anne, who makes the best truffles I think I have ever tasted. She had little samples of her truffles and amazing melt in your mouth caramels, you could literally taste a subtle floral essence from the wildflower honey she uses. I bought a small box of truffles and two single truffles for Nina and I to eat on the spot. Katherine Anne has been making decadent confections ever since her childhood on a sustainable Wisconsin farm. Her mother taught her how to use fresh cream from the family's Jersey cows as well as honey from a nearby farm, to create batches of old-fashioned caramels. Katherine-Annes' Confections are sold locally in Chicago at coffee shops and Wholefoods but you can also order them online here, these are truly a slice of heaven and worth every penny. 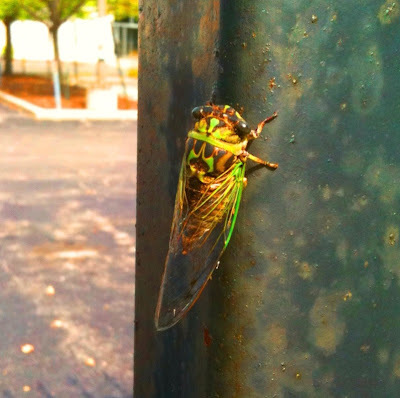 We rarely see or hear cicadas downtown, but we saw this guy clinging to a fence post. This is probably the last one we'll see until next summer. I had such a great time in St. Louis, thanks to my wonderful hosts Judy Cobillas, president of MoFA and Carlene Fullerton, fiber artist and hostess extraordinaire. Thursday evening I gave a lecture at the St. Louis Artist Guild, this was also the site for my workshops on the weekend. 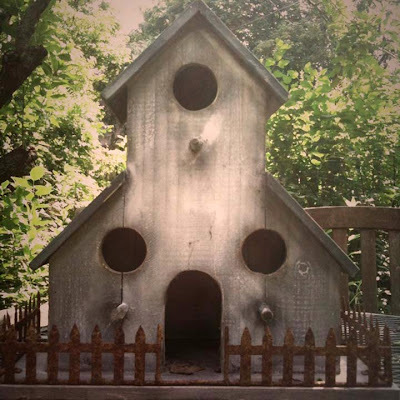 The St. Louis Artists Guild is in an old stone mansion that is being used by the guild for housing exhibits and holding classes. 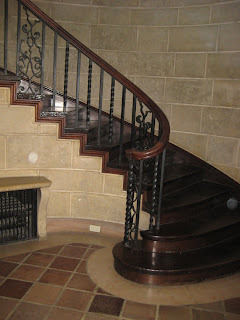 There are some beautiful architectural elements in this building, this staircase in the foyer was particularly impressive. Through out the facility many different rooms were being hung with incredible fiber exhibits as part of the two month long Innovations in Textiles 8. 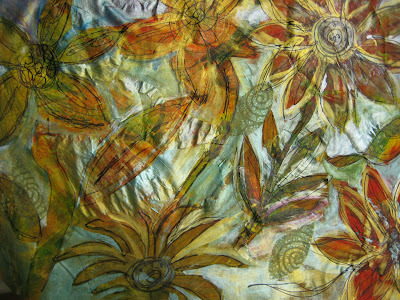 Innovations in Textiles 8 is really such an impressive event with exhibits in numerous galleries in the St. Louis area. 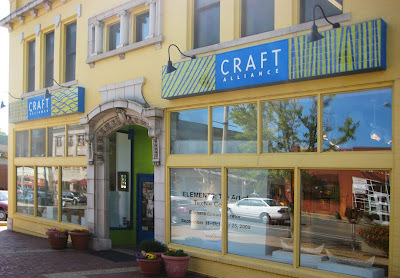 On friday Carlene and Judy took me to several galleries and to the Craft Alliance where there is a fantastic exhibit on textile collage with the work of Joan Schulze, Fran Skiles, Barbara Lee Smith, Bob Adams and Luanne Rimel. 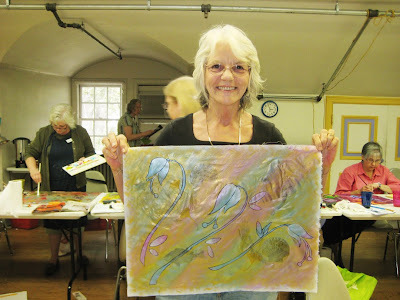 A week ago there were workshops with Fran Skiles and this weekend there are workshops with Bob Adams. There are so many incredible events happening, I hope the fiber world is stopping and taking notice, I don't think anything like this on this scale happens anywhere else. After Gallery hopping we had lunch at Pi, Obamas favorite pizza place, it was delicious! Friday evening we went to the opening of Fibre Vive an exhibit of fiber works influenced by Hispanic arts and culture by MoFA members. Following the opening, I had the opportunity to spend more time with Rosemary Claus-Gray and several other MoFA members over a lovely dinner at Carlene's. 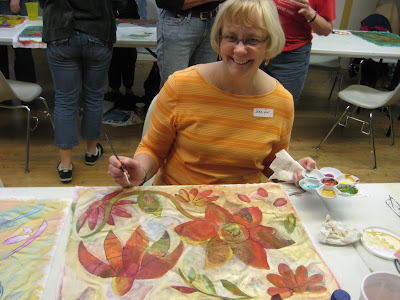 Saturday I taught Mixed media Painted Fabric, I love seeing how each person interprets this technique though the colors and imagery they use. 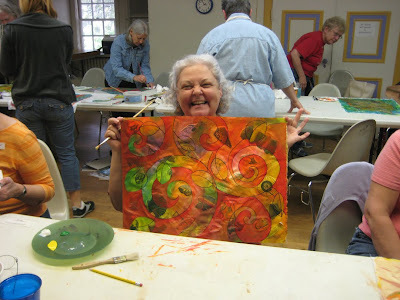 This lovely work was done by Chris, I am sorry I do not know some peoples last names, but Chris has a wonderful gestural quality to her drawing and a beautiful sense of color. Judy and Carlene working. Jennifer, one of several students who traveled from the Columbia, MO area, who I got to spend some extra time with since they also stayed with my host Carlene on friday and saturday nights. 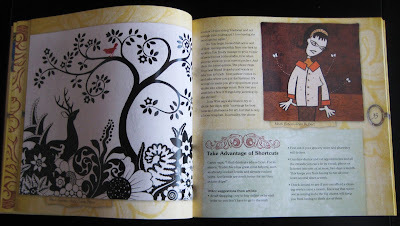 Carol Zeman and Leandra Spangler, who's name was so familiar to me and I just figured out why, she also contributed artwork to Virginia Spiegal's Fiberart for a Cause auction earlier this year. On Sunday I taught Tsukineko Inks, it was a whirlwind of a day covering more techniques than usual, introducing Ink Potion No. 9 into the mix and I never got in anytime for photos. 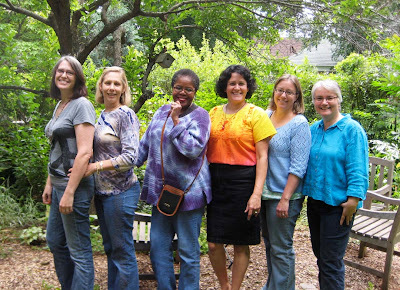 I had a wonderful time working with all these textile/fiber artists who work in so many different media, I had so much fun, I would come back and play with these gals anytime. Ooh, I'm so excited, look what came in the mail! 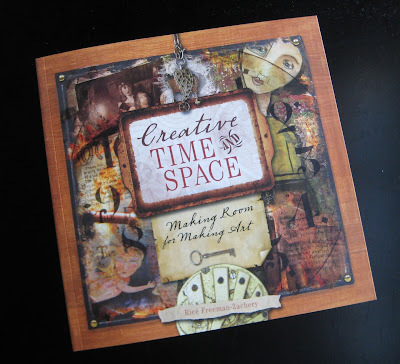 I placed a pre-order for Creative Time and Space by Ricë Freeman-Zachery from Amazon, and it arrived this afternoon, just in time for me to get in some good airport reading tomorrow. Yay! 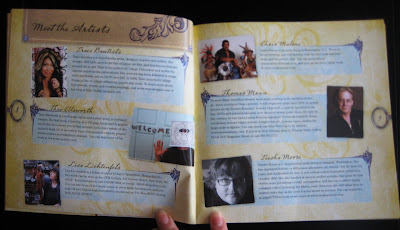 This book is so cool, please forgive the bad/fuzzy photos, the sun is going down and I am anxious to give you a look, since I won't have time to post good photos tomorrow. 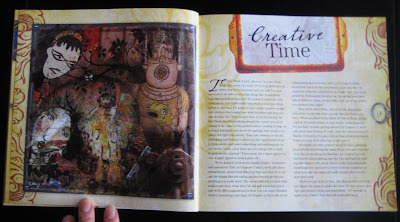 This book is sure to please every kind of creative soul, there are mixed media, textile, doll, sculpture, painter and jewelry artists represented here. Cool montage using samples from everyone's work in this image. 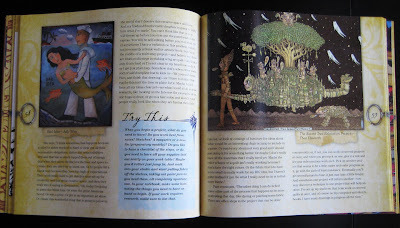 Photos of beautiful art work on every page. 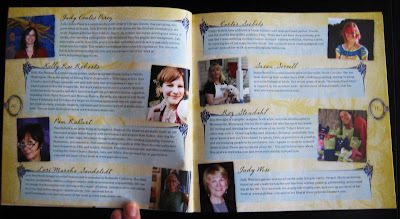 Look, there's me and PaMdora aka Pam RuBert on facing pages. 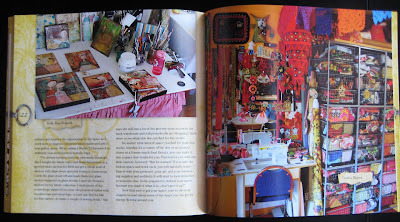 Wonderful tips and ideas from all the artists, including one of my favorite sages Judy Wise. 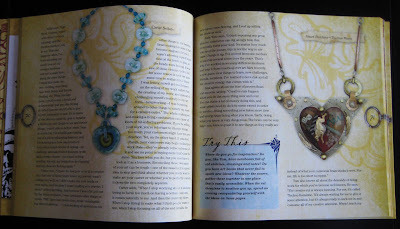 This book is gorgeous, I can hardly wait to sit down and start reading. I am packing my bags, let's hope the kids and dog don't eat each other while I am gone. 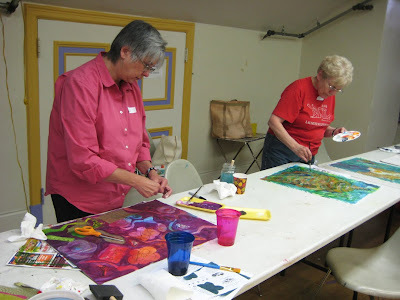 I will be giving a lecture Thursday night at 7pm at the St. Louis Artists' Guild and teaching Mixed Media Painted Fabric and Tsukineko Inks on Saturday and Sunday for MoFA, if you are in the area stop by and say hi. I love having talented friends. These earrings are a birthday gift from my friend Vickie Hallmark, aren't they beautiful? 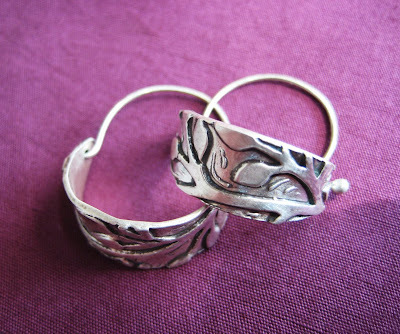 They are made from precious metal clay. 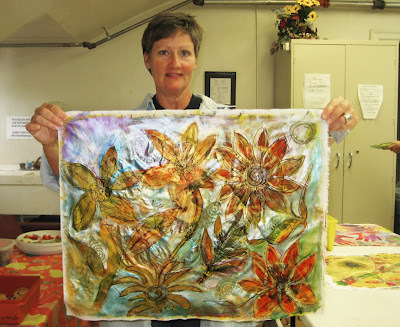 When I first met Vickie, 14 years ago, she was an award winning textile artist, now she has added glass and metal to her repertoire, be sure to check out her blog to see all her wonderful work. Yesterday my friend Trish Williams and I drove out to the burbs to have lunch with Laura Wasilowski, Frieda Anderson, Anne Lullie and Emily Parson. 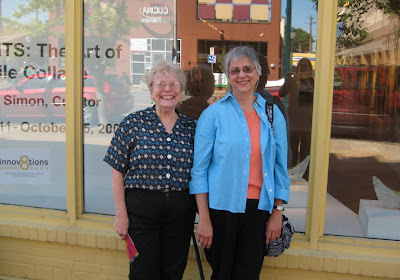 Laura, Frieda and Trish are the new Illinois/Wisconsin SAQA reps., so it was part meeting and part social time. Most of us haven't seen each other since spring, you would think we would all see each other a little more often but with everyone's busy schedules it's hard to find a time when everyone is in the same place at the same time. 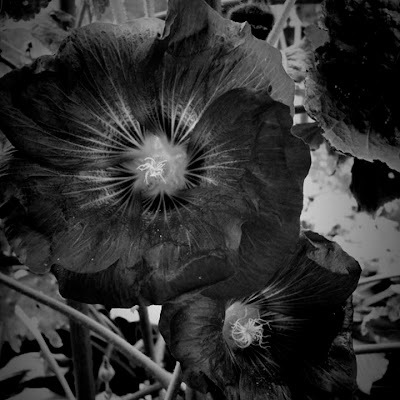 Laura's birdhouse and hollyhocks taken with Toy Camera iphone app. I just bought a relatively new product from Tsukineko Inks called Ink Potion no. 9 to find out how it works with the All Purpose Inks. 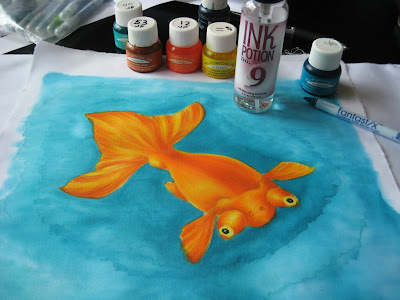 One purpose of the solution is to help blend ink colors. 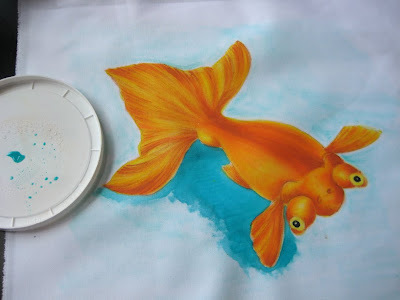 From my estimation this could be a good alternative to working with aloe vera gel to lighten and blend colors. 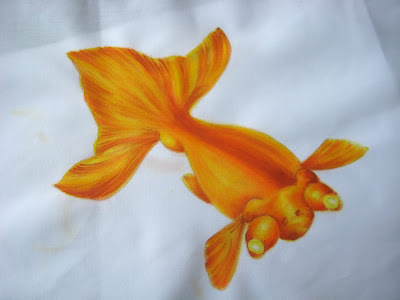 I began this painting by lightly tracing the outline of a goldfish from a copyright free image onto white cotton fabric and gave the fabric a light spritz of Ink Potion. 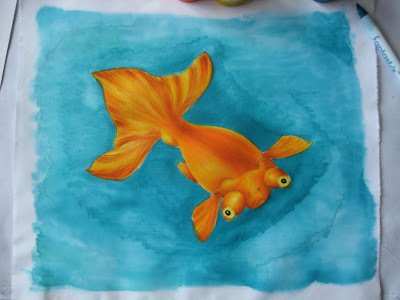 Using the Lemon Yellow ink and the brush tip Fantastix pen tool, I painted in all the light and dark areas of the fish. 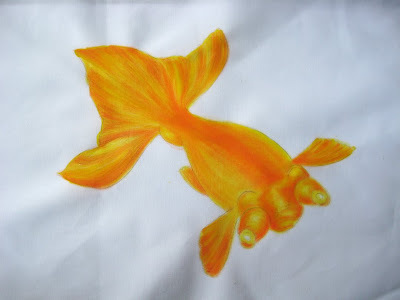 Next I used the Tangerine ink in the areas that are to be the darkest and used a very light touch to blend it with the Lemon Yellow in the lighter areas. 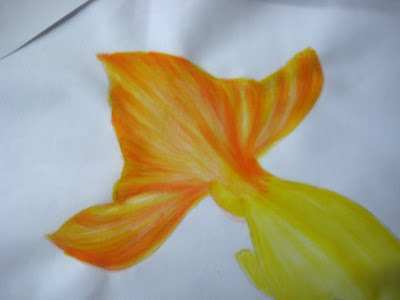 Using the yellow ink again, I painted over the image to blend the colors and to deepen the golden hue. 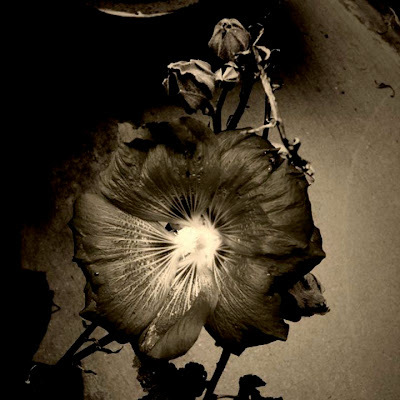 Next I used the color Autumn Leaf to deepen the darkest areas and help create more dimension by pushing up the contrast. I used the Tangerine ink again to blend with the Autumn Leaf, making a smoother gradation and used a black fabric pen to add black to the eyes. 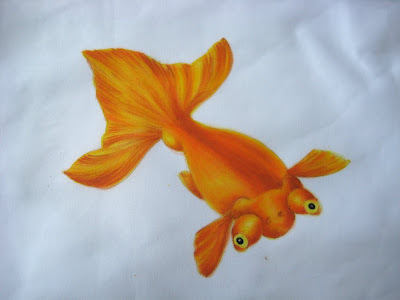 At this point I heat set the fish with an iron set on cotton with a press cloth on top. 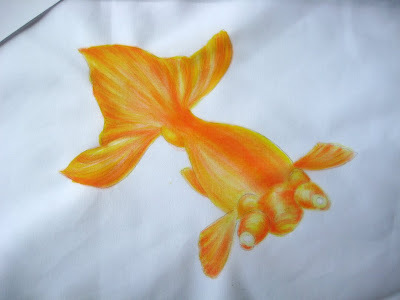 For the water I used Tropical Lagoon, sprayed some Ink potion onto a tray and dipped the fantastix pen tool into the ink and then into solution on the tray. 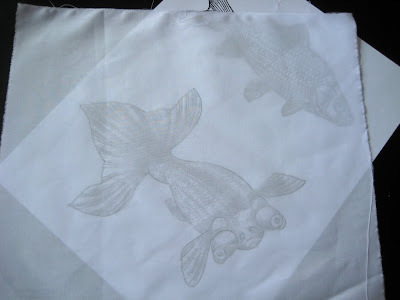 I noticed that this had the effect of lightening the ink color the more solution was mixed in and also making the ink cover a larger area of fabric with less stroke marks. 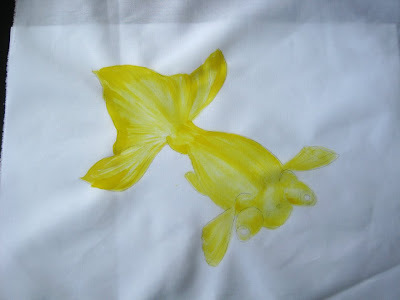 I lightly spritzed the white fabric where I was applying the blue ink to help the color cover the area smoothly. I was working quickly and not too carefully and it ended up a little streaky, but I don't mind because it does look a little like there is movement in the water.